My Minds Eye meets Hero Arts meets Paper Piercing! - 'Funky Sun Shot' - I like the banner shadow! The kids and I escaped for a week during their spring break. I say 'Spring Break', but, as Mother Nature (one tough mama) would have it, it was more of a 'Winter Break'. We had a big adventure: We drove 1,613.4 miles, and spent a total of 28.46 hours in the car (12 hours the first day, 9 hours another, etc.) to make our trip - 3 of those hours were sitting in snow storms! (True figures - my car was programmed to track these things!). We drove through snowstorms and rainstorms to visit some of my closest friends - people I grew up with. 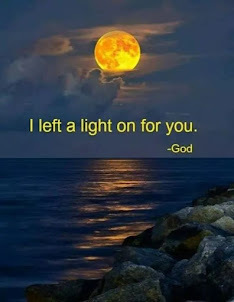 People I got into a whole bunch of trouble made life long pacts with - during my teen years! Anyway, one of us turned 50 - so there was a HUGE party, and then we traveled some more to stay with my BFF for a few days. This all went down in CA. The place I love and still call home.. sniff. 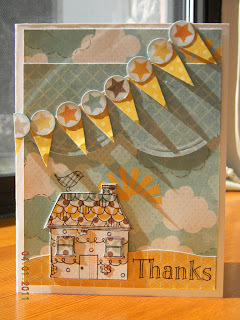 Anyway, the card above, is for the hostess of the party. She is the girlfriend of the birthday boy, and she generously offered her home when four of us started planning this adventure. However, with the rain, 70 mph winds, and flooding conditions, we did a good job of going in and out of her lovely home, and some of the kids (older ones at that!) weren't very good at cleaning their shoes off! I thought a card was the least I could do to thank her for putting up with all of us! And besides, I want to be to be welcomed back again! Oh this is super sweet! Love that cute banner! Sounds like you had fun travelling....some day (I swear to goodness!) we are going to travel lol! 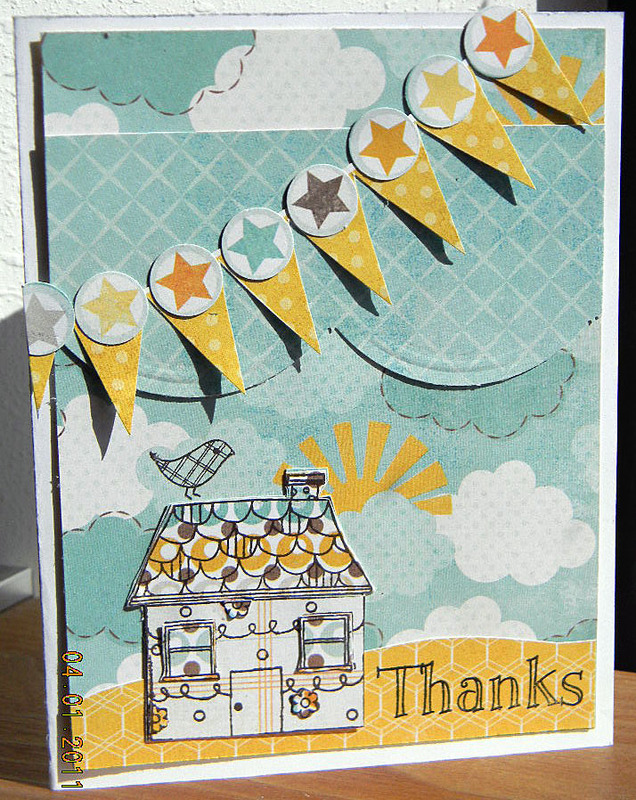 Ahhh...this is a super sweet card, love that little house paired up with MME! Love their papers! Thanks for sharing your traveling adventures! You are too fun! Fabulous design! 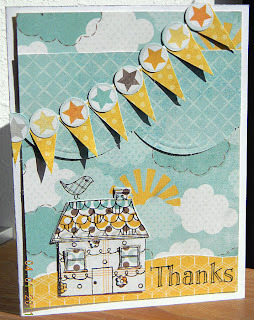 Love those papers and you created an adorable scene! Smooches for the New Bride!! !